We all love to look back on the 1980s as a sort of halcyon time. Transformers were still animated rather than CGI, movies were original rather than nostalgia-grabbing reboots, and we all kept our important papers in Trapper Keepers, just as nature intended. But before you decide that life really was better back in the decade that brought us hair metal, spandex, and She-Ra, consider what we take for granted now that would have been nearly impossible to replicate in the 1980s. As it turns out, there is quite a bit that makes modern life better. A 32GB iPhone or other smartphone can store over 8,000 songs, depending on what other apps you have installed on the device. Alternatively, you can stream music through an app like Spotify or Apple Music, each of which allows you to save playlists and favorite albums. Your phone also offers you a remarkably portable package that you are likely to have on you at all times. 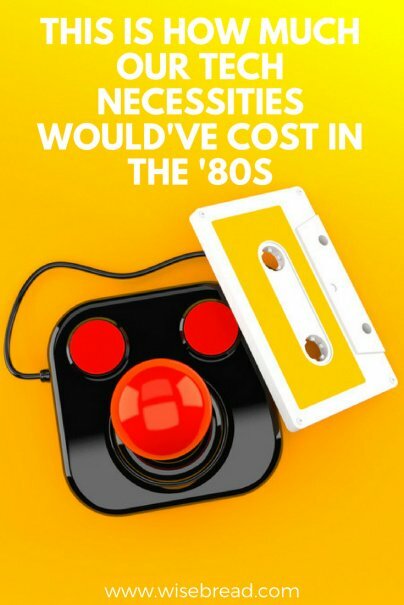 To have all of that in your pocket these days, it will cost you around $450 for the phone, plus about $10 per month for your favorite music streaming service. All together, you might pay $570 in the first year of phone ownership to be able to enjoy your favorite tunes wherever you are in 2018. To recreate this kind of portable music library in the '80s, it would have been much more difficult. To start, you would need a portable CD player. The Sony Discman was introduced in 1985, and cost $300 at the time — or nearly $700 in 2018 dollars. To have 8,000 songs at your fingertips, you would need 570 CDs, assuming about 14 tracks per album. CDs cost about $15 each in the 1980s, or nearly $35 in 2018 dollars — which means you would have to drop the equivalent of $19,950 on CDs to have access to same number of songs. And of course, you could only really take one or two albums with you at a time, since carting around 570 CDs at all times would be next to impossible. Having a mobile phone in your pocket has become so ubiquitous that we have reverse-engineered the term landline for the phone that's stuck at your house. We have become so used to carrying cellphones with us at all times that etiquette rules have sprung up around their usage, including a number of tacit rules about texting vs. calling someone. Assuming that you have a brand-new iPhone X, it cost about $1,000 to purchase the phone, and cell service generally costs about $60 per month, which means a modern cellphone user can expect to spend $1,720 in a year, including the purchase of the phone. Back in 1983, the first cellphone went on sale for $4,000, or around $10,062 in 2018 dollars. While there was no cellphone plan for early adopters who purchased this Motorola phone (which was 11 inches long, weighed 2.5 pounds, and was nicknamed "the brick"), the phone only offered 30 minutes of talk time, and only had six hours' worth of battery life. Netflix streaming has become a staple of modern entertainment, to the point where the term "Netflix and chill" has gone from solid Saturday night plan to dating euphemism to out-of-touch punchline. Subscribing to Netflix's standard streaming plan costs $10.99 per month, or about $132 per year, and gets you access to over 5,500 titles to watch, including both movies and television shows. Physical books will never completely fade away, but e-readers have made it possible for avid bookworms to carry entire libraries with them, whether they are packing for a trip to the beach or just a long line at the DMV. The Kindle Fire can store approximately 6,000 books, which means you can finish one book and start the next without having to go back to the bookstore or library. A Kindle Fire HD 8 costs about $80, and you can sign up for Kindle Unlimited for $9.99 per month, or about $120 per year. All together, a voracious reader can enjoy books to her heart's content for about $200 in the first year. If we assume our reader manages to finish one book a week, or 52 books per year, that $200 in a year cost comes to about $3.85 per book. There are certainly aspects of 1980s life and culture that we'd all like to return to — like having music videos on MTV. But it's also good to stop and reflect on all the great advances we get to enjoy now that would have been simply impossible back when Max Headroom and jelly shoes were still a thing.